Hermetism and Gnosis have always been kissing cousins throughout the centuries. The same can be said with Hermetism’s parallels with the Christian Gospels, particularly the Fourth Gospel, which has many Gnostic themes running throughout. Furthermore, a cursory reading of patristic literature shows that the doctrine of rebirth expounded by Hermes is very similar to the teachings ascribed to Simon Magus, the first-century Gnostic heresiarch, magician, and antichrist-from whose legend, one must add, the later sixteenth century legend of Faustus borrowed some of its distinctive features, as well. Those teachings also neatly add up with Jesus’ sayings from the Gospel of John and the Gospel of Thomas. Peter also seems to teach a very similar doctrine as described by 1 Peter 1:23, which leads “You have been born anew, not of perishable seed but of imperishable, through the living and abiding word of God.” If St. Peter and Simon Magus believed in the same things, is it not curious that they found so much to argue about in the apocryphal Acts of the apostles and in the Clementine writings, where they are represented as antagonists in a series of theological debates and magical contests? Paul in his epistles also taught a doctrine of rebirth as well and also mirrors greatly the life and acts of Apollonius, the great miracle worker and philosopher of the 1st century C.E. We will explore Paul’s relationship (as well as Jesus’s) with Apollonius at another time. Thus it was almost impossible for Agrippa to reject Simon’s demonic doctrines since they sound very close to that of his own Christian-Hermetic faith. Indeed, Agrippa was interested in the initiation rebirth or regeneration mysticism featured in the Corpus Hermeticum and Asclepius. A lot has been said on the subject of Agrippa’s intense interest in Hermetic philosophy in his works. “Yes, Asclepius, since will is (included) in counsel. For <he> (God) does not will what he has from deficiency. Since he is complete in every part, he wills what he (already) fully has. And he has every good. And what he wills, he wills. And he has the good that he wills. Therefore, he has everything. And God wills what he wills. And the good world is an image of the Good One. Both the CH and John utilizes a strong dualistic philosophy, characteristic of the ancient Hellenistic philosophical world. The Fourth Gospel speaks of two worlds, one being light and the other darkness–although much more ethical than it is ontological, like in the case of the Manichaeans. In Him was life, and the life was the light of men. 5 And the light shines in the darkness, and the darkness did not comprehend it. (John 1:4-5). In the Hermetic writings, it speaks of the fullness or “pleroma” of good and the “pleroma” of evil in XI. 4. 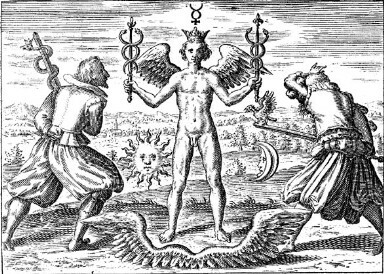 In Agrippa’s De occulta philosophica 44, he writes in an ambivalent yet repentant way about embracing Hermes’ magic and connects it with Simon’s! However, it is nonetheless possible for the mind to receive the knowledge and revelation. Simon also happens to deny bodily resurrection of the flesh (as posited by Daniel 12:2 and Isaiah 26:19), in the Clementine Homilies (2:XXII) along with some other heretical ideas, which seem to be representative of most Gnostic beliefs. And he neither says that the God who created the world is the Supreme, nor does he believe that the dead will be raised. He rejects Jerusalem, and substitutes Mount Gerizzim for it. Instead of our Christ, he proclaims himself. Instead, only the pneumatic self will rise free from the earthly bonds of the flesh. Hermes, the reborn one, also has an incorruptible body and his disciple, Tat is called “steadfast” in the CH. Simon is called the “Standing One” and is even said to have both an adamantine and smoke bodies in the Clementine literature, strangely enough. Could these be simply code words for Simon having a docetic body? Agrippa does not make these connections at all in his writings but one can easily see Peter’s connection with Simon as indicated by Matthew. While this is admittedly speculative, it goes without saying that the Clementine literature makes such great lengths to separate the two figures by putting Simon Magus against Peter in a three day marathon of debate on scripture and religious doctrine representing the Hellenistic Christology of Paul and Marcion versus the Jewish Christianity of the early Apostolic Church. Interesting dilemma indeed! In essence, Peter may have been confused as a “father god” of Mithras much like how Simon Magus was confused with the Roman-Sabine deity Semo Sancus by Justin Martyr, which has intimate connections with Mithras as well. Agrippa’s conflation with the pious Hermes, the holy Scriptures, and that mighty heretic Simon Magus all pointed him in the same direction. How then could he tell whether he was moving towards transfiguration and a godlike knowledge and power, or whether he was destined, with Iannes and Mambres (Egyptian magicians, like Hermes), and with Simon Magus, to the torments of eternal fire? He indicates these doubts in the very last paragraph of the very last book in De occulta philosophia (Book III, Part 5) and quite naturally condemns other heretical magicians like the Gnostics, Valentinians and Ophites as facing the same fate of damnation as Simon Magus. However, if Agrippa had read Acts of the Apostles, he would see that Hermes was very much a part of the Apostles’ lore, as is the case with none other than Paul. 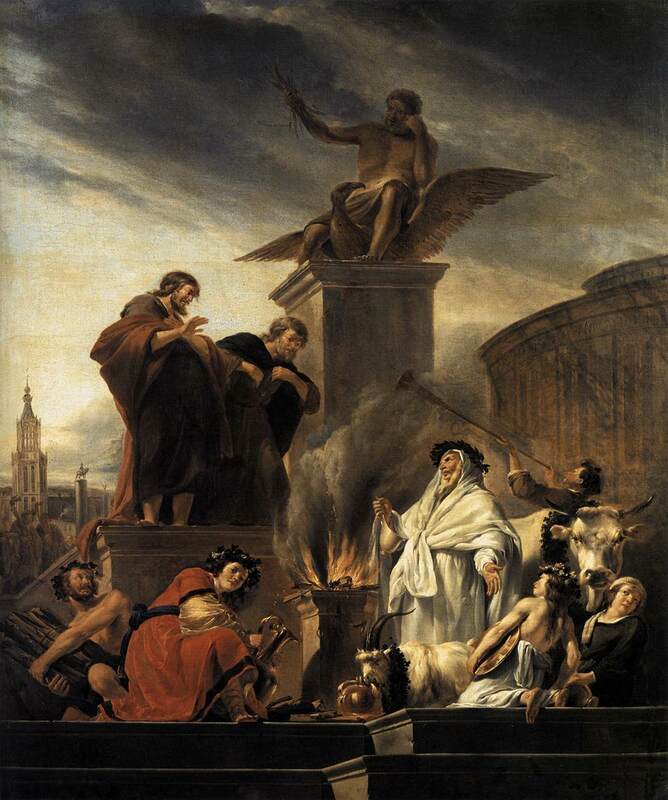 According to the Church Fathers like Justin Martyr, Irenaeus and Hippolytus, Simon was worshiped, associated in the image of both Zeus and Semo Sancus, who were both gods of contracts and legalities. Paul was also “worshiped” or confused as a god and a Greek one at that. In Acts 14:8-10, Paul heals a man who was crippled in the feet. When he heals the man he creates a sensation, and a crowd forms claiming that the gods have come in human form. Paul is called Hermes (or Mercurias in the Latin). 8 At Lystra there was a crippled man, lame from birth, who had never walked. 9 He listened to Paul speaking, who looked intently at him, saw that he had the faith to be healed, 10 and called out in a loud voice, “Stand up straight on your feet.” He jumped up and began to walk about. 11 When the crowds saw what Paul had done, they cried out in Lycaonian, “The gods have come down to us in human form.”12 They called Barnabas “Zeus”and Paul “Hermes,” because he was the chief speaker.13 And the priest of Zeus, whose temple was at the entrance to the city, brought oxen and garlands to the gates, for he together with the people intended to offer sacrifice. The healing of the crippled man’s feet, indicates a connection with the Greek Hermes’ winged feet. Hermes was the messenger of the Olympian gods, Paul is given this name because he was the chief spokesperson. Barnabas is called Zeus (or Jupiter), Zeus was the “father” of the gods. Why does the crowd make the connection between Paul and Hermes? There is a legend which may shed some light on this incident. The couple became greatly afraid because of the miracle, so the gods revealed themselves and told them that they were the only people to welcome them; they would be blessed while the whole region was destroyed. The couple asked only to be priests in the temple of Zeus and that they die at the same time, so that neither had to see the tomb of the other. This story also seems to foreshadow the Sodom and Gomorrah tale in Genesis 19 as well. So what is the point of this story? According to Acts, this was the first time Paul has preached the gospel to an entirely pagan audience. The miracle generates a crowd which thinks Paul is Hermes. There are priests there as well as people about to honor Paul and Barnabas as pagan gods and must contextualize the gospel for a pagan world. But, those pagans weren’t going to let go of Paul and Barnabas without a proper sacrifice in their names! Paul’s confusion with Hermes also mirrors later when Acts 18:24-25 mentions a Jew named Apollos, which is an obvious reference to Apollo, the sun god and son of Zeus! And a certain Jew named Apollos, born at Alexandria, an eloquent man, and mighty in the scriptures, came to Ephesus. This man was instructed in the way of the Lord; and being fervent in the spirit, he spake and taught diligently the things of the Lord, knowing only the baptism of John. So, here we have Paul being mistaken for a god, Simon mistaken for Semo Sancus, while the docetic Jesus of Paul is mistaken for a flesh and blood man. This is merely proof they are all the same individual. In Greek myth, mortals are mistaken for Gods because of their beautiful appearances. The Jesus of apocalyptic lore and messianic expectations can hardly be a man mistaken to be a God. As found in the Acts of John 228, John says to draw a likeness of what is dead is childish and imperfect. The Orthodox and Simon agreed that worshiping images was ignorant but yet the Orthodox allowed it to occur whereas Simon excommunicated followers for the offense of worshiping his consort Helena and himself as Minerva and Jupiter. John is more Arian than Gnostic or Orthodox as he is an iconoclast foreshadow those who denies the use of images altogether as entirely foolish. Maybe Jesus’s warning in Matthew 6:17 of putting oil on your head and washing your face when fasting was not just to avoid being a hypocrite like the Pharisees but in actuality, to appear to be illumined as John in the Acts of John, so the commoners of Rome would see you as a god! Stay tuned for Part 2, where things get really heavy, as the concept of the “divine twin” alive and well in ancient apocryphal and esoteric literature as well as the New Testament!